Advancements in 3D design tools have given manufacturers tremendous productivity gains over the last two decades. Automotive development, for example, is nothing like it was twenty years ago. In this industry, not just styling and engineering revolve around 3D data, but downstream factory processes have evolved to take advantage of the efficiencies that 3D technology offers. One would think 3D CAD should provide the same benefits to the field of architecture and construction. Architects would have a wider palette of forms for expression – curvatures and non-rectilinear textures; contractors would have clearer visuals and less confusion, delays, and overruns when erecting complicated structures. But for the most part, these benefits have not emerged. Although designers can easily model fantastic forms in 3D modelers, the technological advancements soon meet up against human resistance. Personnel used to the traditional methodologies of architectural and construction management – engineers, subcontractors, inspectors – even the AIA itself – all expect contract documents to be delivered in the form of 2D drawings. Experiments in form sometimes require architects to do the extra footwork, mainly plotting 2D drawings derived from their original 3D model. And, describing complex geometries through 2D views invites confusion. According to the website of Gehry Technologies – the software wing of Frank Gehry’s firm – poor data coordination with the field results in cost overruns of 20 percent. Beyond redundancies inherent in the status quo, reducing a form to 2D leaves out the great advantages of modeling. “In the world where changes in the technology may take only a year or two, but where changes in construction can take a whole generation – 35 years or so, we see the huge leap of faith it takes for designers and owners to push these ideas,” says Richard Herskovitz, architect of Architectural Woodwork Industries (AWI). What if all the processes of construction were based around the 3D model? In contrast to the inertia of the rest of the industry, Philadelphia-based AWI is a subcontractor that has chosen to embrace 3D technology. Its advocacy of a 3D-centered workflow is how the firm achieved the curved woodworking on EMPAC’s concert hall at a cost that rivals cubes. EMPAC was designed by Grimshaw Architects, and modeled in Rhino; Davis Brody Bond are the local architects of record and coordinated all of the consultants, provided the Contract Documents and supervised construction. The firm’s methodology is a glimpse of how construction could be, and, given that the overall approach has more efficiency and more common sense than the traditional route, there’s no reason to believe that it is not what construction will be in the future. Optimizing the power of 3D on- and off-site not only makes building curved surfaces possible, it makes building faster, cheaper, and more accurate. The white steel frames and floor-to-ceiling glass panels on the Experimental Music and Performing Arts Center (EMPAC) seem typical in a modern campus building, but a glance through the windows of the new event center in the Rensselaer Polytechnic Institute reveals the shell of a three-story auditorium, rounded on all sides, top to bottom. The hive-like interior structure is entirely covered in a crosshatch of smooth wood panels, furthering the auditorium’s surprising organic presence. Designed by Grimshaw Architects, EMPAC uses curvilinear surfaces as its centerpiece. The design is emblematic of the new experiments in sculptural forms and texture in large public building projects. 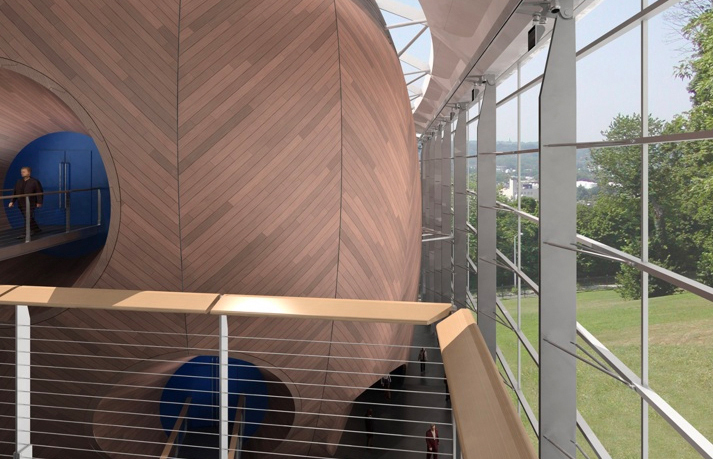 When the main contractor, Turner Construction Company, awarded the bid for the EMPAC’s wood paneling to AWI, the woodworking specialist had an unusual stipulation. Coordination between AWI and all other subcontractors would use the original 3D design model as its shared point of reference. Instead of the expected 2D drawing the trade had relied on for generations, the concrete and structural steel subcontractors received a copy of modeling software, some brief training, and the 3D auditorium design divided into construction phases. The reason for AWI’s close relationship to 3D modeling comes in part from the needs of the material itself. The architects and engineers adopted a 3D mentality back in 1991 when computer-drafting programs first appeared. At the time, woodworking machinery from Europe began to employ computerized drivers, and specialty programs aided in many standardized cabinetmaking tasks. The equipment was highly accurate, much more so than the manual set of equipment. Ever since, the firm has constantly kept pace with new 3D technology, applying the latest innovations to the needs of the industry. Its expertise has translated into AWI taking on increasingly difficult large-scale bendwood interiors, often working with the designer from conceptual design through construction. AWI has developed its methods over the course of several major sculptural panel projects such as Philadelphia’s Verizon Hall at the Kimmel Center, and the interiors of the Boston Convention Center. In curved wood designs like these, superior accuracy is needed when hanging the panels. If the underlying structure strays too much from the planned dimensions, the subtly curved cedar planks will fail to fit together. “As wood is a material which expands and contracts about an eight of an inch for every eight feet, we need about eighth-inch tolerances.” These margins for error are about four times tighter than what is seen at typical construction sites. Framing for housing, for example, might vary around a half-inch. In AWIN’s quest for woodworker’s accuracy, the firm discovered processes like digital manufacturing and robotic transiting, as well as the benefits of planning construction phases in 3D. These new methods have also produced some unexpected side effects: bringing down costs and speeding up building processes. The first step in constructing EMPAC’s distinctive shape is to ensure accuracy in the 3D model. The project architect, William Horgan, modeled Grimshaw’s concept in a special industrial design modeler Rhinoceros. Rhinoceros uses mathematical equations called NURBS (Non Uniform Rational B Splines) to construct surfaces, and so can calculate any point on a complex curve with pinpoint accuracy. “This NURBS engine capability for analysis and extremely high accuracy on curves is limited to a very few applications only,” says Herskovitz. >Rhino was used as a common platform for coordinating the steel, concrete, ductwork and outer skin, and the live model projected and used to coordinate these systems in weekly meetings. The inner Hull concrete wall formwork was modeled in Rhino by Perri Forms in Germany and inserted in the master model for checking purposes. Clients embarking on 3D construction should not be overly concerned about which modeler is used to create the initial design, he says. No matter what design files it receives from the client, AWI can easily import the geometry into a full NURBS environment. Rhinoceros also fluidly imports and exports 2D geometry in common formats used by AutoCAD. Collisions were manually detected using Rhino, and provided the visualization used to explain issues in Team meetings, and as a logistics tool for the Hull panels. Specific collisions were identified and solutions found jointly, rather than in a lengthy a RFI process. Decisions were made jointly and committed to meeting minutes, saving weeks and countless hours of staff time. Here the extension of the inner acoustic wall through the outer steel, and the overhang of the slab were seen and corrected without RFI, and via a weekly meeting centered around the model. Even the lack of attachment of a steel gusset was visualized in this same way. These common problems would not be found using collision detection software, but were found by visual inspection. Rhino was used to extract geometric information and send it to Radius Track to bend the studs and track in Minnesota. Each double curved surface of the wall panels was divided into equal spaces in order to develop the curvature of each stud and track making up the panels. Those models were then sent digitally and extracted into a special program which drives the bending equipment. The advantage of the Rhinoceros system is it allows AWI to break up, curved geometries into discrete parts, number them and organize them for later stages of the project. For the EMPAC auditorium project, a single engineer, AWI Project Manager Ron Evans, refined the model and exported particular shapes and arcs into structural analysis programs. Further, the modeler enables the design model to be broken down into component parts, numbered, and organized for later construction. One of the more innovative methods of AWI’s new approach lends itself from the field of manufacturing. After Evans subdivides the designer’s 3D concept into smaller components within Rhino, the 1200-seat concert hall skin resembles more of a series of small manufacturing projects. Just as manufacturers would fabricate prototypes of chairs, AWIN produces its building components in a factory environment. The studs were then assembled using drawings derived from the panel models allowing Eastern Exterior Wall Systems assemble them accurately off site, and to deliver them in the proper sequence. A full sized mockup of a portion of the most curved area and the portal were used for approval by the design team and the owner. By extracting the surfaces of the support “blades” from a Rhino model, fabrication information was provided in AutoCAD to the metal fabricator to drive a CNC laser cutter to cut the blades. As a consequence of this automation, the fabrication labor costs are not much more as if all the steel panels were all curved identically. The computer drivers simply read each panel’s geometric instructions and the machine cuts, drills, or crimps the materials accordingly. Off-site fabrication is nothing new. The 1972 construction of the New York City World Trade Center involved factory production of identical steel grids that formed the exterior lattice. What is new is that today’s 3D computerized cutting allows all the parts to be unique rather than identical, enabling the construction of a curved surface at a giant scale. To maintain the exceptional accuracy gained in shop fabrication, AWIN must hang the panels on the concrete and steel substructure according to the same standard. This is achieved through the use of robotic transits. Similar to laser-measuring equipment already common to the construction site for preliminary surveying, a robotic transit can be programmed with the 3D monitoring points from the NURBS model. Robotic mechanisms move the laser pointer by remote control, eliminating the need to enlist an extra worker to operate the station. Rhino was used to extract the location of points for placing the panel support “blades” and then transfer the information to AutoCAD for the surveyor to prepare their input for the transit. The robotic transit located the Center Line, height and distance from the steel structure so that angle irons could be welded in place correctly. The technique is the final step in the continuum of three-dimensional processes. The construction site is now linked to the virtual model. In effect, an enormous x-y-z grid is overlaid the project location, complementary to the computerized 3D forms. The result is high-accuracy installation, but it is also cost-effective. The automated techniques allow the EMPAC panels to fit onto the substructure perfectly, eliminating hours of costly re-work that would normally plague a project of such complexity. AWI used Rhino to design the special 3D structure in wood for the lower portals, and to cut the shapes for the curved edges out of FR Plywood. The complex shapes of the upper portals included double curved track and straight studs covered with 22 GA sheet metal to provide a non-combustible back for the wooden exterior. Though 228 2D assembly drawings were created, the only way for the architects to check the shape and approve the drawings was by inspecting the 3D Rhino model in 3D. Here, the South side bridges needed acoustic separation from the wall of the Concert Hall. Thus proof that the panels had a few inch gap was critical and proved to be correct. In fact, all of the blades and panels fit without misalignment. The biggest innovation, and biggest challenge in moving to 3D-based construction may not be digital, but social – changing the attitudes and entrenched ways of approaching problems. To avoid cost overruns during AWI’s paneling stage, it was necessary to have the earlier phases of concrete and steel layout to maintain high standards of accuracy. “Fortunately for us, Jasper DeFazio, Turner’s Vice President, was a proponent of this approach from the start, and Rensselaer also invested in modeling by having AWI model all of the important shapes to aid in coordination,” says Herskovitz. Herskovitz advocates 3D as a means of coordination for all the players in the field in order to more clearly define the phases of construction, and to assign responsibility between owners, designers, and subcontractors. To win all the benefits of 3D construction, processes need to change, including the traditional roles and duties of each player. # # # A version of this article was published in CGArchitect. Architectural Woodwork Industries, composed of woodworkers with many years of shop and field experience and two trained architects, provides consulting, engineering, project management, budgeting, and scheduling services along with the fabrication, and installation of fine woodwork. Based in Philadelphia, AWIN builders are in the forefront of using 3D CAD/CAM technology to achieve affordable and quality high-concept wood designs. To view past projects, visit www.awin.net. Rhinoceros provides the tools to accurately model your designs ready for rendering, animation, drafting, engineering, analysis, and manufacturing. Rhino can create, edit, analyze, and translate NURBS curves, surfaces, and solids in Windows, without limits on complexity, degree, or size. Rhino gives the accuracy needed to design, prototype, engineer, analyze, and manufacture anything from an airplane to jewelry. Rhino provides the compatibility, accessibility, and speed in an uninhibited free-form modeler that are found only in products costing 20 to 50 times the price. To see the many diverse products designed with this affordable 3D tool, and to download a free evaluation version, please visit: www.rhino3D.com. This entry was posted on Thursday, May 7th, 2009 at 4:53 pm	and is filed under Architecture and tagged with 3D construction processes, Architecture, digital manufacturing, Rhinoceros, wood. You can follow any responses to this entry through the RSS 2.0 feed.